This is a fun animated TV show from the early 1970s. It is named after an all-girl pop music band that is at the center of the show. The band performs in funny leopard-print outfits, complete with tails and ears. As they tour, going from one exotic location to another, they keep getting mixed up in local mysteries and solving them. In every episode, an original song gets played over a humorous chase scene related to the mystery or adventure in question. The series is notable for being a relatively early female dominated show. It also features the first African-American female role to appear in the Saturday morning line up. The recurring characters include four women, two men, a pet cat and a pet alien. The women are bandleader Josie, her two band mates Valerie and Melody, their roadie Alan, their road manager Alexander, his evil plotting sister Alexandra, Alexandra's cat Sebastian, and Josie's fluffy pet alien Bleep. In addition to solving a mystery in every episode, much of the show revolves around the interpersonal drama amongst the main characters. For example, Alexandra and her cat Sebastian are usually plotting against the others, and Alan is the love interest of Josie. Josie and the Pussycats nearly get early retirement when they board an empty yacht controlled by a designing countess who seeks to prematurely age the girls. During a trek through the Peruvian mountains, the Pussycats are attracted to an eerie green glow vibrating behind a mysteriously deserted village. The Pussycats accidentally get their paws on a top secret blueprint intended for the World Scientific Foundation and are returning the material to the Foundation when intercepted by The Lazer. He is a maniacal wizard who schemes to build a device from the blueprint capable of stopping all the machinery in the world. The Pussycats and their companions become jet-setters when they travel the globe in one day during a frantic chase. The Shadow, leader of a secret international crime organization, is after a black box handed to the teenagers by an Interpol agent. Melody becomes a brain-child when Prof. Leighton, a renowned scientist, transfers a secret formula recorded on computer tapes to her brain. The Pussycats become the target of an inscrutable Chinese man known as the Serpent when Melody acquires an ancient Chinese coin that holds the secret to great power. The Pussycats are doomed for stardom when the dirigible in which they are performing at the World Expo in Florida takes off and lands on the island of Dr. Strangemoon, a diabolical scientist who plans to launch satellites that will attract comets and cause world-wide disasters. The Pussycats are chased by a tyrannosaurus after a plane taking them to Puerto Rico makes an emergency landing in a forest. The group stumbles on an impossible mission in Amsterdam when Melody, mistaken for a secret agent, is given a pair of wooden shoes concealing a miniature tape recorder and picture. The Pussycats are involved in an atomic chase in Mexico when they are pursued by The Scorpion, a power-hungry ringleader who is after a vial of glowing nuclear capsules hidden in the hollow of Melody's drum. 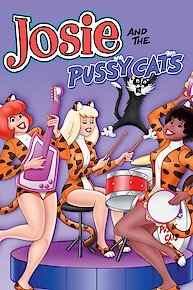 The Pussycats befriend Professor Isaac Belfour, a scientist who invented an invented an invisibility formula. They take him along for their gig in Puddletown, England, to protect him from Mr. X, a former laboratory assistant who stole the formula. A skiing vacation in the Alps accidentally leads the gang to the mountain fortress of Midas, a gold hoarder who has invented a gold-destroying blue microbe mist with which he is seeking to dissolve the world's supply of gold. After checking in at the Bombay Tilton Hotel, Alan, Josie and Alexandra are kidnapped by Kaseem, a political usurper who leads a band of hooded scalawags called the Secret Six, and taken to his sanctuary. Over the Amazon, the companions become part of a cargo drop on Dr. Greenthumb's supply zone. Greenthumb, a diabolical scientist who schemes to destroy all living flora with his lethal creature plants, brings the group to his plantation where he sends them for a walk along his deadly garden path. On their way to Pago Pago for a musical stint, Josie and her companions find themselves in troubled waters when the ship on which they are sailing is torpedoed by Captain Nemo, a swarthy scoundrel intent on avenging his great grandfather's name by sinking every ship in the world. Josie and the Pussycats is currently available to watch and stream on Warner Bros.. You can also buy, rent Josie and the Pussycats on demand at Amazon, Vudu, Google Play, iTunes online.